At the tail end of the Nineteenth Century, a devastating storm swept over the coast of Texas, hitting the small community of Galveston and effectively wiping it from the map. As the official death toll mounted (eventually reaching 8000), Americans were stunned at the concept of an untamed nature that could still bring such tragedy to a scientifically advanced society. As well as being one of the great tragedies of American history, this was a tremendous media event. 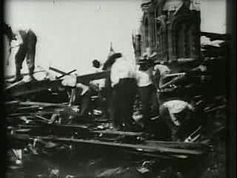 Reporters swarmed the area, and Edison Studios sent a man down with a camera to cover the wreckage. This in spite of martial law, and the threat of arrest or shooting for anyone seen taking pictures. It’s interesting now to view this early newsreel footage, in light of our changed expectations of privacy and publicity. I assume that the ban was enacted out of a sense of respect for the dead and their families, to prevent “vultures” from swooping in to profit from their loss. Today, when an event like this takes place (think of Hurricanes Katrina and Sandy), we as a nation assume the right to participate remotely, to grieve along with those who are suffering. We also understand the power of images of destruction to bring financial support and to urge the government to take action. These images of this particular tragedy help us to record a changing sense of journalistic ethics as a new era of media engagement began.